Director Michael House and Fred Lyon will be present for the screening. “We Are Alive! The Fight to Save Braddock Hospital (Tony Buba, 2012, 85 min.). 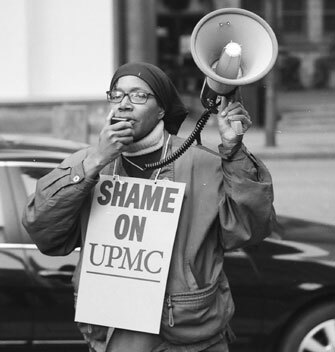 This documentary chronicles the residents of Braddock, Pennsylvania, organizing to fight a corporate healthcare giant to keep their community hospital. Shot in cinema verité style, the film follows the work of the community over a two-year period through daily setbacks and struggles, portraying a town’s strength, dignity, and spirit. “Photo Center is proud to welcome photographic artist and filmmaker Emily Hanako Momohara to an artist talk at Photo Center NW. Momohara will be spending the month of June working in and around Seattle (and at PCNW) on a new documentary film about a woman named May Namba whose life has chronicled many of life’s hardest and cherished aspects: war, incarceration, freedom, discrimination, love, family, generosity, patriotism and perseverance. Learn more about the project here. “Two fellowship recipients will be awarded $2,500 each and a solo exhibition at HCP in the summer of 2012. One Houston-based artist (residing within a 100 mile radius of Houston including the Beaumont, Galveston, and College Station areas) will receive the Carol Crow Memorial Fellowship and another artist from anywhere in the world, outside the Houston area, will receive the HCP Fellowship. Christopher Rauchenberg of Blue Sky Gallery (Portland, OR) will jury the fellowship selection. photographic, film/video, and lens-based installation work. One fellowship will be awarded to an artist residing within a 100- mile radius of Houston (including the Beaumont, Galveston, and College Station areas). A second fellowship will be awarded to an artist living anywhere in the U.S or abroad. The entry fee is $35 for up to 10 images. Past recipients, HCP staff, Board, Advisory Council, Committee members and their significant others are not eligible. For the full prospectus and to submit, click here. All applications must be submitted online through SmarterEntry.com. We will not accept emailed submissions, CDs or actual prints. “As part of their Postcards from America tour, five Magnum photographers will discuss photography and ways to picture America for this discussion. VIEW A LIVE WEBCAST of this event starting at approximately 7 p.m. CST on Friday, May 13. “The Audience Engagement Grant (formerly called the Distribution Grant) supports photographers to take an existing body of work on a social justice or human rights issue and devise an innovative way of using that work as a catalyst for social change. We are interested in well-designed projects that inspire audiences visually and create meaningful interactions with photographic content. Five to eight grants of $5,000 to $30,000 will be awarded. Click here for the application guidelines.